join us in our corner of paradise. Welcome to our 38th season! The Swag is a mountaintop hideaway bordering the Great Smoky Mountains National Park near Asheville, North Carolina. Come see why Andrew Harper named The Swag the “Most Romantic Hideaway” in his 2018 Grand Awards and why Condé Nast honored The Swag as the #2 “Top Resort in the South” in its 2017 Readers’ Choice Awards. Reservations may be made online or via phone (828) 924-0430. Gift Certificate purchases can be made by calling and speaking to one of our friendly Guest Services associates. Located in Waynesville, The Swag offers unparalleled hospitality, natural beauty, and tranquility. 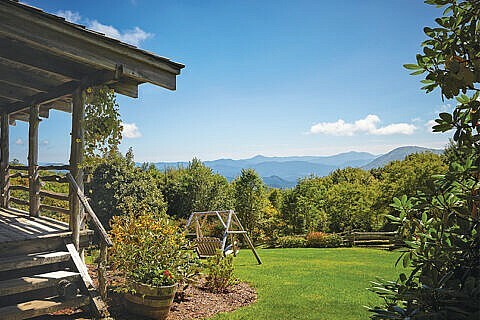 Escape the crowds and join us at the South’s finest mountaintop inn. Click here to see live video from the Swag Webcam. Rates at The Swag are all-inclusive. Make your reservation today. Take a tour of our individually decorated guest accommodations. Planning a honeymoon or romantic getaway? Consider these romantic options. Your meals are included with your stay. See what’s on the menu. Interested in our Cooking School for 2019?